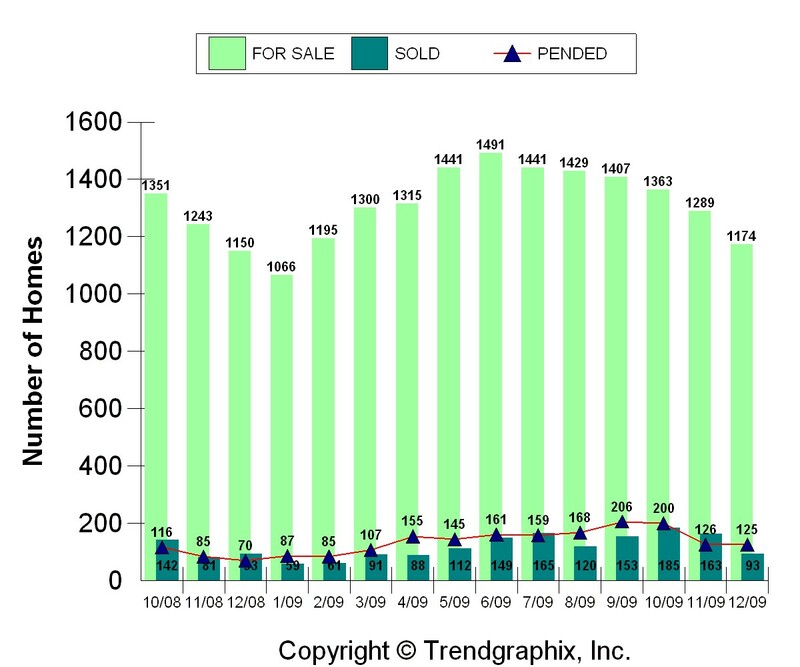 What Were The Odds of Selling Your Seattle-Eastside Condo in December, 2009? December. 2009 1174 condos for sale, 125 condos sold, 11% odds of selling. November, 2009 1289 condos for sale 140 (now 126)condos sold, 11% (now 10%) odds of selling. December, 2008 1150 condos for sale 70 condos sold 6% odds of selling. *Adjusted from previous month’s original numbers to reflect the actual number of condos sold and closed. Some of the sales originally reported last month failed and did not close. Thirteen percent of condo sales originally reported in October failed to close. The number of condos for sale also dropped by 115 units, which is 9% decrease in the number of condos available for sale on Seattle’s eastside. The eastside condo sales remained about the same as November. The year finished out with sales happening, but not as many as September and October. Those months were affected by the 2009 first time home buyer’s tax credit. With the extension and expansion of the home buyer tax credit into 2010, there’s the added benefit of a tax credit, but only if you buy before the end of April, 2010. December, 2009 Seattle real estate finished the year off on a more positive note. With so much of the Seattle area real estate market showing “yellow,” there was a solid return to a real estate market more evenly balanced between buyers and sellers. This is more like the real estate market we saw in the 1990’s. There was still a significant increase in real estate sales from December, 2008, with West Bellevue leading the way on Seattle’s eastside. The number of West Bellevue home sales shot up by 279%! Because home prices in West Bellevue tend to be among the most expensive on Seattle’s eastside and in the Seattle area in general, this signaled more of return to confidence in the real estate market. Prices for high end homes have dropped to the point that buyers were more comfortable buying. Since most of these sales had nothing to do with the first time home buyer credit, this signaled a strong change in buyer confidence and willingness to buy. Prices tended to be more reasonable all over the Seattle area. Lower prices, low interest rates, and the first time home buyers’ tax credit did a lot to open up the real estate market. The year ended with the lowest number of homes on the market for all of 2009. The amount of properties for sale was similar to what was available in 2007. This does not mean the market will return to 2007 real estate activity, but it is a good thing to see that there were, and are, less properties for sale in the Seattle area. I expect the extension and expansion of the 2010 home buyer credit to continue to spur real estate sales on. I also expect it to bring more home sellers into the market, so competition could increase again. The number of properties for sale is a huge factor in pricing and market time. The first part of 2010 should be pretty active for both home buyers and sellers. After April 30th when the home buyer tax credit goes away, much will depend on how many homes are on the market and the interest rates. As I’ve mentioned before, be prepared for any and everything with real estate sales in the coming months. There’s no “one size fits all.” Home sales will depend on the price point, location, the home’s condition, the competition, and/or a combination of these things. Some homes will sell quickly and for a good price, others will still undergo significant price reductions to meet market expectations, and others will sell, but for less than one would expect. This, actually, is what we expect to see in a normal, more balanced real estate market. What do the numbers on the map mean? 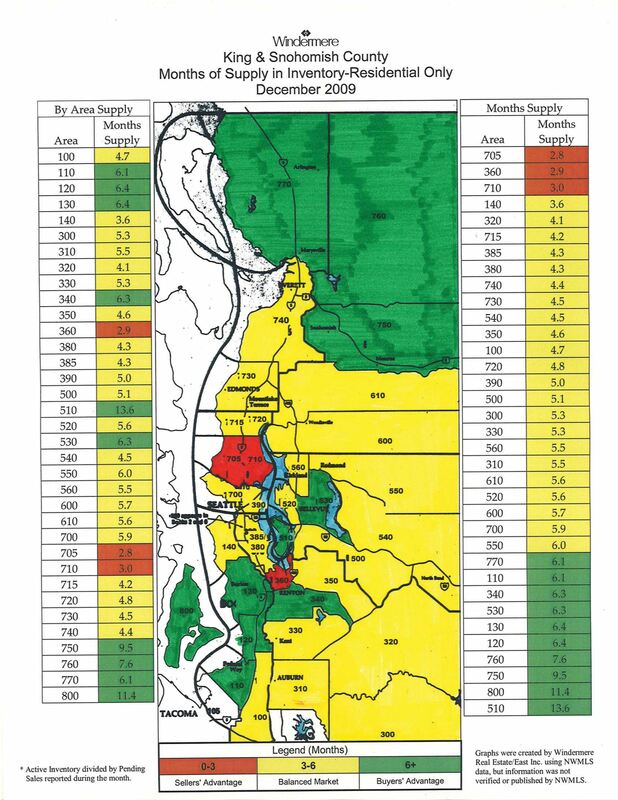 The map is divided into the numbered areas as defined by our Northwest Multiple Listing Service (NWMLS). Downtown Bellevue is area 520 and East Bellevue is area 530, as an example. Red means it’s a sellers’ market, a sellers’ advantage. Yellow means a balanced market between buyers and sellers. Green means its a buyers’ market. If you take each area as shown on the map and look to the area number on the side of the map, it will tell you how long it would take to sell every home currently for sale if no other home came up on the market in that area.